One of the main reasons dentures are one of the most popular replacements for teeth is because of their easy care and natural appearance. Like teeth, dentures also need daily cleaning and maintenance, and that’s why people usually use a denture cleaner. The purpose of this element is not only to keep them free from stains and looking their best, but also to control the growth of micro-organisms on the dentures, and it must be used only when dentures are out of the mouth. What Can I Use To Clean My Denture? Sometimes, we don’t know exactly what do dental cleaners contain or which one is better for our needs. That’s why making your own denture cleaner can be a great option to avoid undesirable reactions, plus it’s easy to make a denture cleaner with ingredients that we usually have at home. Baking soda and vinegar. Combine the two elements in a glass container and mix until the solution begins to bubble. Then soak the teeth in the solution all night. This makes an excellent natural alternative to keep your teeth white and clean. Aloe Vera. This gel is a treatment that is helpful in preventing fungal growth. Applying the gel on dentures twice a day for a few minutes and then washing it away with a solution of half vinegar and half water can help loosen plaque and eliminate stains. Bleach. A light dose of this product won’t harm your denture. Our recommendation is to brush your dentures with a solution that contains one part bleach and two parts water. By doing this, dentures can stay white and shiny. Although buying dental cleaner is very usual, there are a few things that you should avoid when thinking about cleaning your dentures, such as abrasive cleaning materials, whitening toothpaste, and hot water. All of these can damage the material your teeth are made of. The majority of dental cleaners contain an active ingredient called persulfate, which lately has been a major concern. In some people, persulfate may cause allergic reactions which can lead to tissue damage, rashes, breathing problems, low blood pressure or gum tenderness. Products like baking soda and vinegar can be easily found in any store, they’re natural, and surely will keep your teeth looking at their best without giving you any reaction. 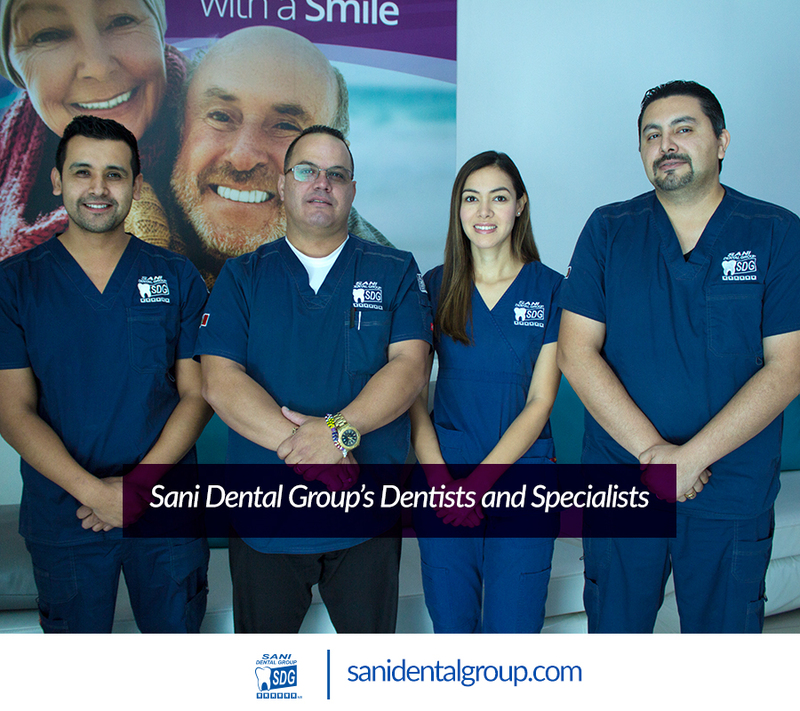 Taking care of your teeth and denture is essential and Sani Dental Group knows it better than anyone. If you have any questions or doubts about your dental care, don’t hesitate on giving us a call or schedule an appointment with one of our doctors and specialist. Your smile is very important to us!